Allergy Friendly “Daiya Vegan Cheese” – Allergy Foodie: Thrive with top 8 food allergies! I must say the cheddar style shreds lived up to its promise – the grilled cheese sandwich was quite a success with dad and son! Encouraged – I made a bold foray into the world of mac n cheese. The real taste test was when his friends who eat regular cheese tried it and gave it a double thumbs up 🙂 Yayy for the mom who made it but the real yayy goes to the ingredients used! Since then I have tried pepperjack style in mexican dishes especially quesadillas and the mozzarella style shreds on pasta and pizza and in pasta sauce, grilled sandwiches and lasagna. Daiya has got it right – the cheese definitely gets a double thumbs up from me too. It makes me want to experiment and come up with new dishes which I will share in future blog posts – dips, appetizers, sauces and more! 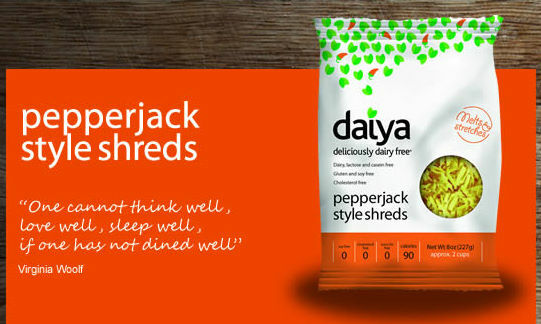 Posted on 4 Jul 2011 16 Oct 2011 by Anu RaoPosted in Product ReviewTagged Daiya, Vegan Cheese. Previous Previous post: DariFree: a dairy-free milk alternative! Next Next post: Is an Epinephrine auto injector safe in the car? On my Low Amine Recipes blog, I have created a free downloadable tool for people who like to cook, but have food allergies. My friends and I all have different food issues, so I have one set up for all of us. Thought I would share the wealth and pass my useful cooking tool on to you. Please use it and feel free to pass the link along to anyone else that might find it handy. I would love if you would link to it on your blog. It sounds like it could be really useful to your target audience. Good luck, and happy eating! Pingback: Interview with Circle of Moms… | Allergy Foodie – thrive with top 8 food allergies!